Many years ago when Ebay was in its infancy I remember seeing an accordion with a piano keyboard on each side. I saved the picture somewhere, but can't reach it at the moment and may have lost it. I've never seen another one of these oddities until today. Here on Ebay in the UK is a Soprani Luttbeg. As far as I can make out these accordions don't have a real name - so I propose that these are called Luttbeg Accordions after the inventor Max B. Luttbeg. Max B. Luttbeg arrived in New York from Russia in the early 1900s. 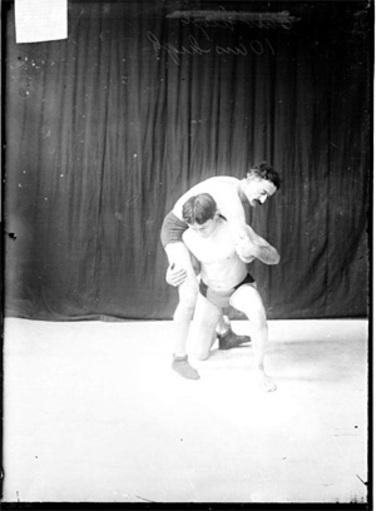 He was a famous wrestler and this picture of him is in the Library of Congress. Max is the one kneeling. After he retired from wrestling he went on the vaudeville circuit playing accordion and also made his own improvements to accordions. The patent for the 'Luttbeg Accordion' was filed in January 1931 in the US, and a further patent improving the system was submitted in January 1932. 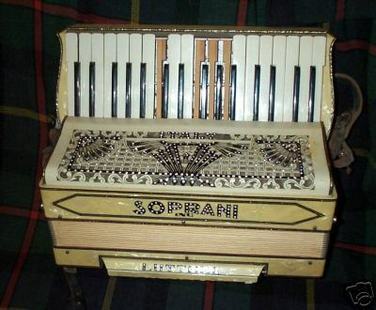 As well as Soprani at least one other manufacturer made Luttbeg accordions as John Gaunt's site has pictures of two types of Soprani and also a Bertini. The site also claims that only 12 Luttbegs were ever made. The reason that these accordions never caught on will be clear to anyone that plays the piano accordion. It's very hard to push the bellows at the same time as holding your hand in the right position to play a piano style keyboard. It seems that Max Luttbeg himself recognised these problems and submitted another patent in 1939 - this time for a 36 button layout. Each button sounded a single note and complex chords could be played by pressing combinations of buttons. Sadly I don't know if any of these accordions were ever built. If anybody has any further information on the Luttbeg accordions then please leave a comment. geez, they would be a nightmare to try to play...cute though. I have one of these except it is a black "mother of pearl?" My grandma talked to the man who made it, he was in Elkhart, Indiana in about 1945 doing repairs. She didn't remember his name. She says he said there were only 8 or 10 of them made. He offered her $1000 on the spot but grandma didn't take it. I have pictures and a video as I am getting ready to sell it on eBay. Mike, can you send those pictures and video to me so that I can post them here ? Hi, I am Max's grandson and have two of his accordions with single keyboards. Several times when the doubles came up on Ebay I have bid for them. I cannot imagine anyone playing these as so many have mentioned. Max arrived in the US and joined two older brothers, Morris and Jacob, who became a respected photographer in NYC. Max was also in vaudeville, where he played the accordion and took on all takers in a $25 given if I cannot pin you in one minute. I think he did make at least one of the double keyboard units in St. Louis, because I remember seeing one. He never played it in my presence. I would love to find one of his concertinas but have never seen one anywhere other than when he played one at his home. Does anyone have a lead on one? I have a Luttbeg Piano Accordion. It is simply beautiful. Any idea of the value? 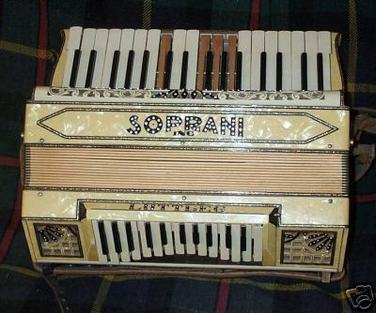 I have a black Soprani Luttbeg in very good condition - I intend to put it up for sale soon but have no idea of the value. . . Would appreciate any advice available in that regard.